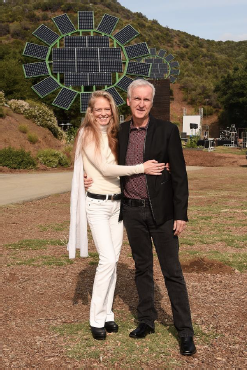 Director James Cameron and his wife Suzy Amis Cameron discuss the new solar Sun Flowers that the filmmaker designed for their childrens’ school. Solar panels are an increasingly common fixture on the roofs and south-facing walls of homes and businesses. But typically, the rows of photovoltaic panels don’t make for a very exciting design element. 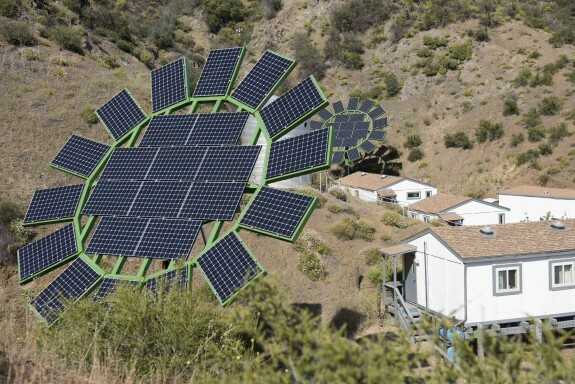 So how about turning the solar arrays into a “functional work of art” that signals the source of energy with its form? 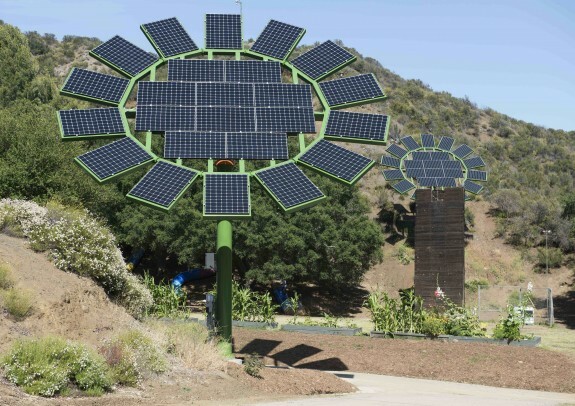 That was the goal of filmmaker James Cameron, who designed five “Sun Flowers” as a 50th birthday gift for his wife Suzy Amis Cameron, to be sited at MUSE, a private school in Calabasas co-founded by Amis Cameron and her sister Rebecca. The sun flowers consist of a “sun flower table” of fourteen 68” x 44.5″ petals attached to a sturdy 16’4″ mast; they stand up to 33′ tall and 28.5′ in diameter. 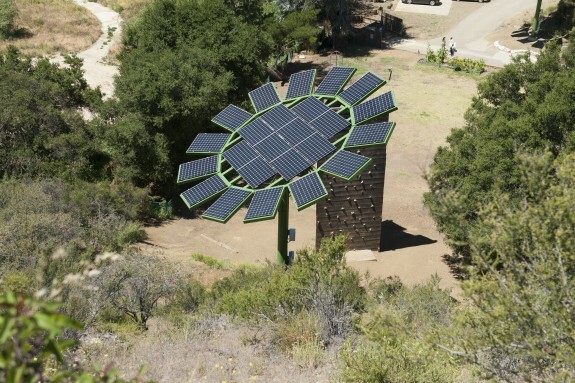 Installed just recently, the five Flowers, scattered about the school’s bucolic Malibu canyon campus, are said to have already exceeded its goal of offsetting 75 — 90% of the school’s power usage. Young students are expected to play a role in monitoring energy use on their web-based “dashboard,” in keeping with the school’s educational philosophy that aims to teach “eco-literacy” through stimulating students’ interest in the delivery of energy, water and food. DnA: You were a student of physics, James. What was your role in creating these Sun Flowers? James Cameron: I didn’t do any of the structural or electrical engineering, but I did the initial design. I basically drew it out, I did the power calculations. I knew that off the shelf you could get the tracking bases and so on. 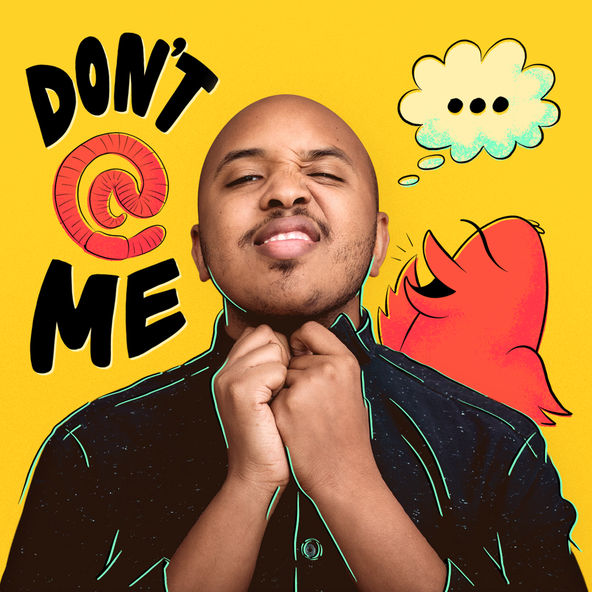 So as a filmmaker, I bridge the gap between engineering and new technology on the one hand and kind of art on the other hand if you will — art and storytelling. And for me this is kind of in my wheelhouse that way, because it’s a functional art piece of technology and also it kind of tells a story at a very kind of deeper symbolic level. DnA: Does the flower shape in any way reflect the functionality, as in, do the “petals” unfold like petals? JC: Not really. It’s just about getting solar panels arrayed so that they face the sun and track with the sun. But by putting them in that radial pattern so that they look like the petals of a flower makes a kind of cognitive connection to what it means: solar is good for the natural environment and is good for biodiversity. So you look at a flower as kind of a symbol of life, a symbol of nature and so there’s a kind of unity of form and function that I think appealed to us when we started on this project. DnA: Now you said there’s a cognitive connection. Are you saying that’s because the children learn about energy saving through having these sunflowers here? Suzy Amis Cameron: What’s really exciting is in the MUSEum (Muse School’s museum), the children are already starting to make their own replicas of the sunflowers. But we have a dashboard that we’ve created as well so the children are really learning about input and output. They’re brand new. They just went into operation about a week and a half ago, so the world is wide open in terms of how they’re going to use it. But I would be willing to bet that our output will get much less because the children are going to be so aware of it. JC: I think it’s just literally about closing the loop. (You show the kids), there’s the sun, that’s the panel, that’s your light bulb in the classroom. You close a loop cognitively. It’s the same thing that we’re doing with food right up on the hill; there are the organic gardens and the kids go work there and do some of the planting and then sometimes they harvest it and take it to the lunch area and they actually eat the food they make. So you have solar power, wind power, rainwater catchment, and growing your own food. These are all lessons in taking local responsibility and not relying on big centralized infrastructure. So I think that’s a pretty good model for the future, especially as large infrastructure is breaking down and having to be replaced at great cost, that we don’t even have the budget to do properly. DnA: I understand you’ve published the design for open source. JC: It’s not out there right now; we just got our patent application in a couple days ago. The purpose of the patent application is so that somebody can’t take it and monopolize it, because we want it to be open source globally. We’ll present all of the engineering work online, because a big cost for us of putting in these five sun flowers was the non-recurring engineering costs. So we can eliminate that from somebody else’s budget. So, rather than do a few hundred that we provide, hopefully there could be thousands of these things around the world, if people are inspired by the design. DnA: I do find it inspiring, and it makes me think that you could have sun flower farms akin to wind farms. JC: You could, I mean there are big farms with tracking arrays but they tend not to be very aesthetically pleasing; they’re usually just rectangular. 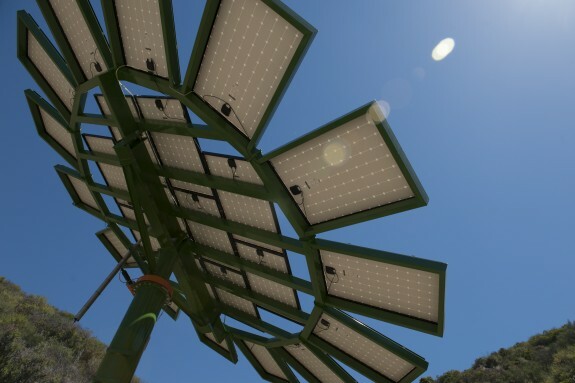 I think the idea here was incorporating solar into landscape architecture, into community centers, into school campuses and science centers things like that, so that people see solar as part of their lives. And I wanted to make that subconscious connection between the solar technology and life in the sunflower being a symbol of life or nature. DnA: People might look at these and think, ‘I’d like one of these in my backyard. I’d like to actually power my house this way.’ Is that possible? JC: Absolutely, if you had a yard that was large enough that it could track through 270 degrees as the sun moves during the day. The limitation with rooftop arrays is they’re fixed, and your house may not be south-facing or your roof angle might not be exactly right to install solar panels. But this always finds exactly the right angle to the sun. So for a relatively small surface area, it’s actually producing a lot of power– probably two or three times the amount of fixed rooftop array. DnA: This is an example of distributed networks of energy, and now there is more conversation about localizing control of energy and water. Do you feel that’s the future? JC: I think it could be a big help. I mean everybody’s got a roof, you’ve got rain gutters, you could do local water catchment, you could have your own cistern; you could have integrated networks of cisterns, and I think this is where it needs to go. People are going to have to take some local responsibility, and especially in California. But you could do this everywhere and stop thinking about the water coming in from hundreds of miles away. Because that’s maxed out; it’s all spoken for. There’s only so much water in the Colorado River. DnA: Do you feel like this is like a pivotal moment for the state in terms of energy? JC: I think it’s a pivotal moment for the human race right now, and we need to really fundamentally change the way we do things. And yes, innovation will be a big part of it. I’m a little nervous about innovation, because the more we’re constantly impressed by what technology can do, the less responsibility we’re individually willing to take in terms of living differently, eating differently and the things that we need to do. Because there’s a sense that the techno cavalry are going to come over the hill and save us. But the more we delay taking responsibility for climate change, energy use, water footprint, carbon footprint, all that sort of sort of thing, the bigger and more heroic those giant technology projects are going to have to be — right at the same point that our economy is getting severely damaged by the effects of runaway climate change and resource depletion. So we may not be able to afford that techno optimist’s solution, I mean carbon sequestration hasn’t been proven at scale, you know all the things are people are talking about are just ideas. So I think the answer is distributed at the level of the individual. We just need to change how we think. 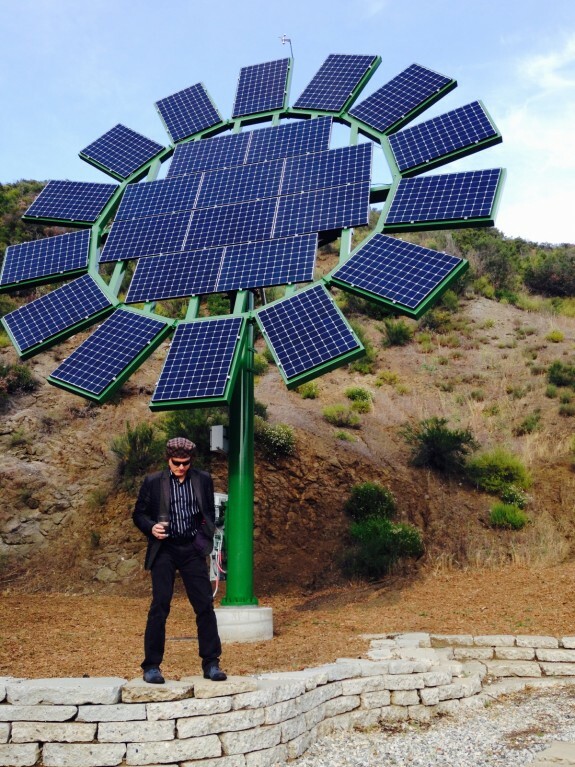 DnA: It would be cool to put these “sun flowers” in the Santa Monica mountains. JC: Sure. You could put them out — not in regular, rectilinear rows out in the Mojave Desert where nobody would see them — but you could kind of scatter them across a hillside like spring flowers blooming and I don’t think it would be onerous to people visually. 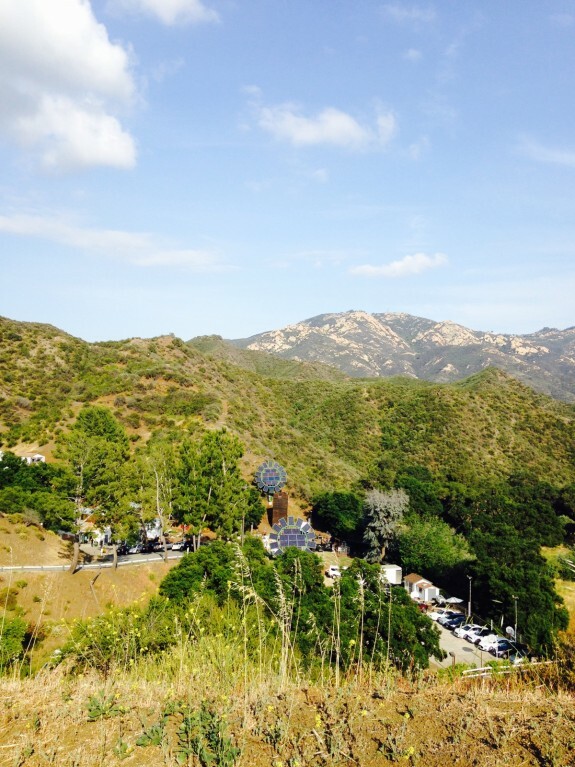 DnA: It could be a new symbol for L.A. — Hollywoodland for the twenty-first century. JC: It’s a good idea, but let somebody else do it! Our plans are online, you can go do it. The Sun Flower technology was supplied by Sonnen Systems. The project was managed by Steve Wiseman.